The TetherPro HDMI Micro (Type D) to HDMI (Type A) Cable connects to the GoPro Hero®, many point & shoot digital cameras, camcorders, Android Mobile devices, and Smartphones and is ideal for streaming HD Video or photography. The TetherPro HDMI Micro (Type D) to HDMI (Type A) Cable connects to the GoPro Hero®, many point & shoot digital cameras, camcorders, Android Mobile devices, and Smartphones and is ideal for streaming HD Video or photography. Easily connect the Micro cable to any HDMI TV or monitor for instant streaming or mirroring. 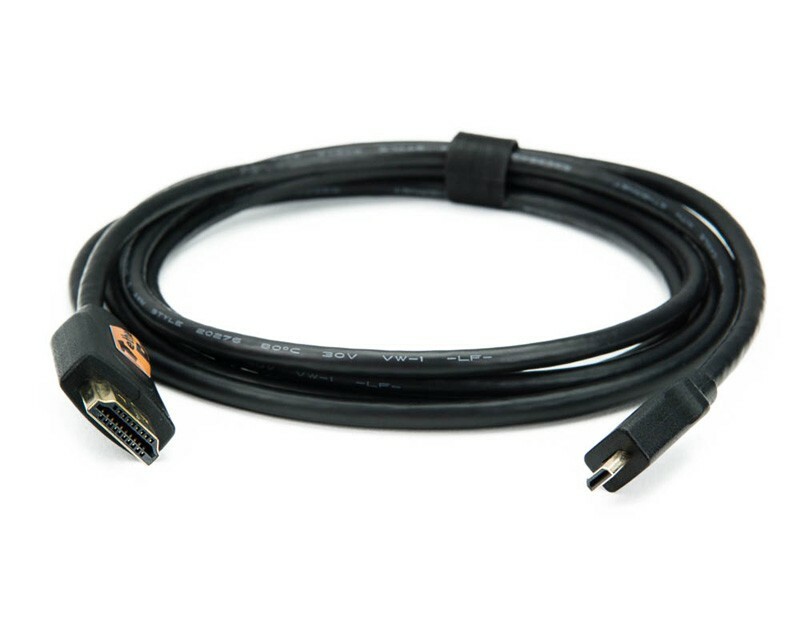 With an All-in-1 high definition High-Speed AV connection, the TetherPro HDMI Micro Cable is available in 3′(1m), 6′(1.8m), 10′(3m) or 15′(4.6m) lengths and is the optimal choice for HD Video, Live View, audio, photography, or streaming data from compatible devices to any HDMI component. HDMI Micro connectors are the high definition standard and allow you to connect portable HDMI equipped devices (such as point & shoot cameras, camcorders and Smartphones) to the standard HDMI connector found on most televisions, monitors and A/V receivers. This cable offers the newest HDMI Ethernet Channel technology, which consolidates video, audio, and data streams into a single HDMI cable, combining the superior signal quality and convenience of HDMI connectivity with the power and flexibility of on-the-go video and photography work. TetherPro HDMI Cable delivers both clear, high definition video and high resolution, multichannel digital audio and achieves bandwidths up to 10.2 Gbps for stunning HD pictures and up to 4092×2160 resolution.